Got my audiobooks for this book today, as it is the next Reading Group book. I really hope this book is more enjoyable than Crime and Punishment. Seems a lot of books so far on Peterson’s reading list have interesting insights, either in part, or as a whole, however the digestion of them is not as enjoyable. Wigan Pier’s use seems more a reference material for how things were back then, as well as a rant on the character’s of socialism. Crime and Punishment’s use to me, was a tool for argument, and a reflection of inner desires fleshed out a bit more. It was a very arduous read, and so much dialogue, hours of it, had nothing to do the value of the book. 1984 use seems as a tool for argument, and a test for communism versus the human spirit. Brave New World so far has been the best discussion book so far, as to me it seemed relatable and humorous throughout the entire book. Does anyone particularly enjoy reading these? Or do they stick with it for the pieces of value that stick with them afterwards? If it is just for the value side, I must admit, that is indeed a rare accomplishment of a book. So far all the books from the reading list that I’ve read (with the exception of Man’s Search for Meaning) have left me with a concept that has stuck with me. For translations, as with Crime and Punishment, the translator duo Richard Pevear and Larissa Volokhonsky are perhaps the best. For Crime and Punishment, Oliver Ready seemed better to me, as it included footnotes of all the subtle references. However, Ready has not translated any of the other Dostoyevsky novels, so for consistency, Richard Pevear and Larissa Volokhonsky seem the best choice for the rest. All that said, unfortunately, all the audiobooks do not use any of the best translations and nearly all use the Constance Garnett translation, which is among the worst. 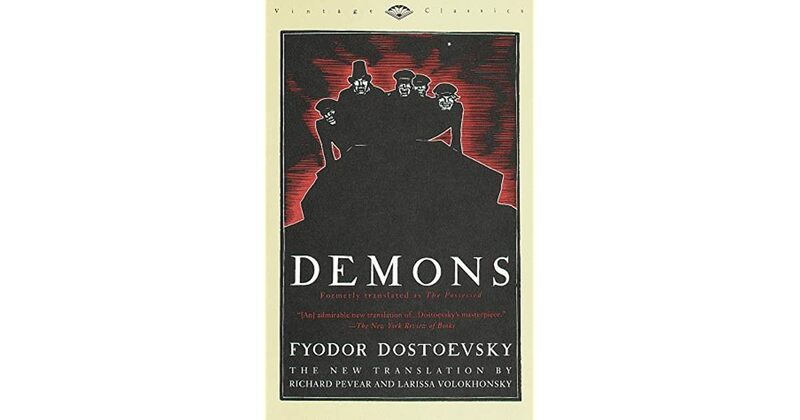 I finished reading demons last week, it’s a very long and complex book. If your hoping it’s going to be more enjoyable than crime and punishment I think you’ll be disappointed. Peterson stated it takes 200 pages before it gets interesting, I’d argue 400. I’m glad I read the book and if I’m honest, I’d need help understanding all of the psychological messages in it. There were times when you could really connect with the characters feeling of desperation and it was a great insight into Russia in that epoch. The story is easy to follow despite the complex messages within. After reading the book I searched all over for a break down on YouTube of the book by an expert, no luck though. Frustratingly there is a vital chapter left out of the book which you can read at the end as an add-on, It would massively change the way in which you though of one of the main characters if only it was put in where intended by the author. Looking forward to hearing people’s thoughts. I’m proud that I managed to stick with it all the way through though, so I’ll thank Peterson for that. Oh wow, I just realized it’s 880 pages long. I was planning on reading it over the month of May but will definitely have to start in on it sooner. Thinking I might give up on this book. I’m 5 hours of the 28 hours into it, and don’t care about any of the characters, nor is any of their dramas or conversations interesting. And so much things happen it is hard to keep up or care about all the random chatter and events. If you’re not getting anything out of it, I’d say to give up. Maybe you can find a condensed summary to take in before the end of next month. I just finished The Brothers Karamazov and it was the best book I have ever read, packed with insights into human nature perfectly relevant to today. I read Crime and Punishment for the second time last year, another brilliant work though with a more focused theme. I would NOT recommend them for an Audiobook to anyone however. You have to treat Dostoevskys books like you would a serious college textbook… And you want to get an A on the exam. They are very serious, complex, and profound. I probably read every passage of Karamazov two or three times each in order to digest it properly. But if you do, and understand it, you will be changed and greatly for the better. At about halfway through Demons I realized I really should have been taking notes on characters and events. I think I’ll have to do that for the next Dostoevsky novel I go through. When reading Nietzsche I also felt like I had to re-read passages multiple times, as each time I finished a paragraph I have a better understanding for what the whole of it was, so I then needed to read it again.